Winter is the best time for shellfish here on the West Coast, especially for mussels. Our mussels become toxic in the warmer months, and even the clams can get iffy in summer. So I find myself cooking a lot of tasty bivalves between Thanksgiving and April, when our mussel quarantine begins. Now this soup does not necessarily have to be a hearty winter warmer, but it definitely fits the bill — I’ve also made lighter, summertime versions of it substituting tomato for the roasted red pepper and easing back a bit on the pasta. Either way, this is an Italian classic. Sardinian classic, really. And many Sardinians will make this distinction, noting that they were not part of greater Italy until quite recently. 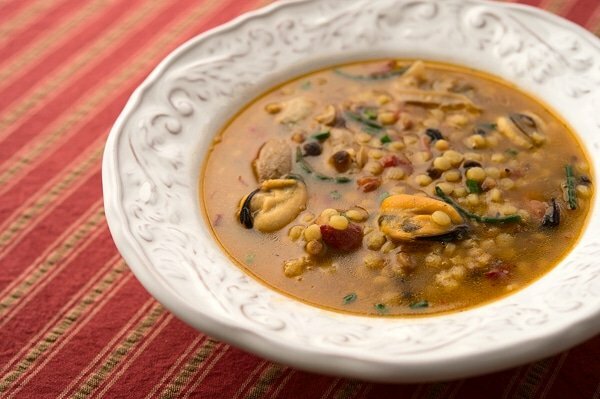 Their name for this soup is fregula kin arsellas, which is basically fregula pasta with baby clams. My recipe is loosely based on one I found in Efisio Harris’ Sweet Myrtle and Bitter Honey, one of the few books on Sardinian cooking written in English. Traditionally this recipe is make with baby clams, so use them if you can get them. I use Western littlenecks, which are actually a kind of cockle, but Eastern littlenecks and Manila clams work great, too. I also like to include mussels as well, which is not traditional. I also switch out the tomatoes in the classic version for fire-roasted red peppers, which are more of a winter ingredient for me. Some of the “water” in the broth is seawater, which I boil first and then strain to rid it of impurities. Seawater makes this soup powerful, briny and achingly perfect for a crisp Vermentino, one of Sardinia’s best white wines. If you aren’t near the ocean, remember to salt your water liberally. I add sea beans, a/k/a salicornia or glasswort. It’s a crunchy, green succulent plant that grows on seashores worldwide. And I often will toss in a few smoked mussels, just for accent. It really adds a lot to the dish. 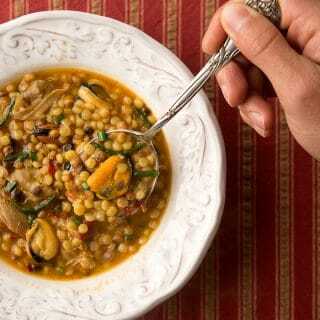 While you need not do any of the special things I do to make this soup, you really do need either fregula pasta or Israeli couscous to make it correctly. You can buy fregula online, or you can find it at many good Italian specialty shops nationwide. If you must, you can sub in orzo, but it won’t be the same. Making this soup is pretty straightforward, and the base stores well for a couple days in the fridge. If you do want to eat this soup over the course of a couple days, however, toss in only as much pasta and shellfish as you plan to eat in one sitting. This prevents the seafood from overcooking and the pasta from soaking up too much broth. If you are using wild mussels, scrub their shells and pull off their beards. You should not have to do this with farmed mussels. (Here's a video on the process from my friend Becky.) Scrub the shells of the clams, too. Pour the seawater or salty tap water into a large, wide pot with a cover and bring it to a boil. Add the mussels and steam them open, removing each one just as it opens. This should take 3 to 5 minutes. Do the same with the clams. Pick out most of the meats from the shellfish; put them into a bowl with some olive oil. Leave a few mussels in the shell if you want — it makes the soup look more interesting. Strain the shellfish broth though cheesecloth or a paper towel into a bowl and set aside. Crumble the saffron into it while it is still hot. In a large soup pot, heat the olive oil over medium-high heat and saute the garlic for a minute or so. Add the cayenne, parsley, stock and shellfish broth and mix to combine. Bring it to a boil and add the fregula pasta. Simmer this until the pasta is nearly done, about 10 minutes. Add the roasted red pepper, shellfish, sea beans (if using) and cook for another 3 minutes. Right before you serve, add the lemon zest and chives. Serve with crusty bread and a crisp white wine. A perfect winter soup. 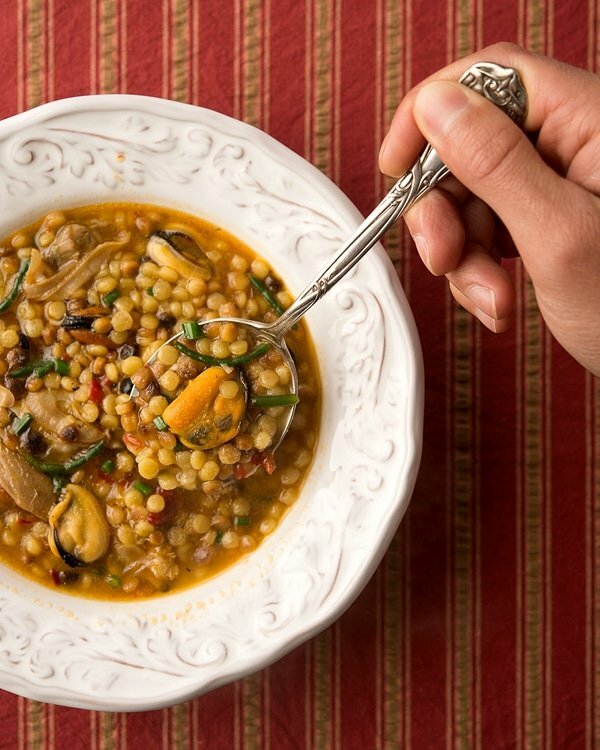 Incorporates all my favorite ingredients, including fregula, sea beans, shellfish…yum!